Here you can download publications by Alexander V. Frolov about theory and experiments on time rate control. Experimental projects were made in 2002-2003, in Russia. Congress "Time Machine" was organized April 12, 2003 in Moscow by Faraday Lab. Ltd.
"Action", theory by Alexander V. Frolov, Report on International Congress " New Ideas in Natural Sciences", 1996. 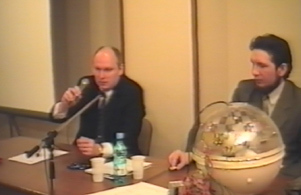 Alexander V. Frolov (left) and Vadim A. Chernobrov (right), April 12, 2003, Moscow, Congress "The Time Machine".